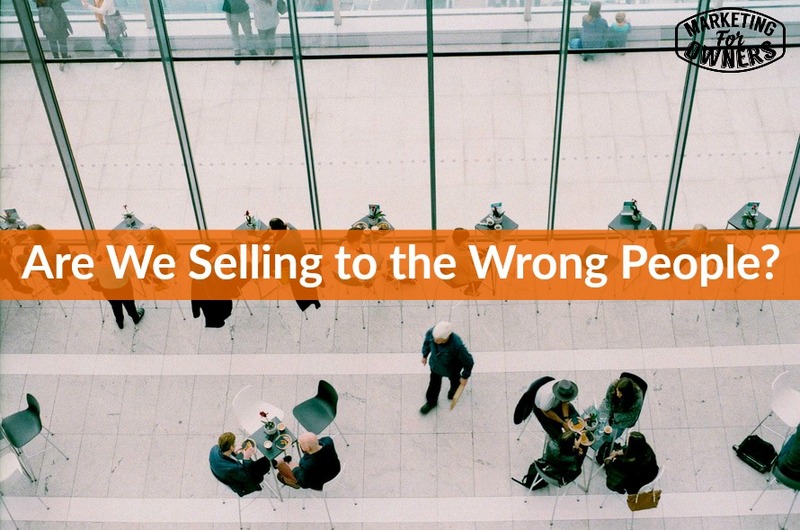 No matter what marketing you do, no matter what selling you do, there is always going to be a wrong person. Now I’m going to read something that is going to set off a light bulb. But quite simply, selling to the right person is more important than all the sales methods, all the copywriting techniques and all the negotiation tactics in the world. Simple as that. The wrong person doesn’t have the money. The wrong person doesn’t care about you and the problems you solve. The wrong person cannot be persuaded by anything. Now somebody clever wrote that. And I have forgotten who it is. But it’s exactly correct. Your marketing and your sales should be only targeted at the right person. Now remember, you might be thinking of companies and businesses. But when you sell something, no matter what it is, it is to an individual. So if you write a blogpost or a tweet, it’s not a company that reads it, it’s an individual. So if you need to be thinking of contacting the right individual, if you are approaching a large company, say have a big ticket item or some major software, you need to contact the correct people in that company. So if they’ve got a 1000 staff and multiple offices, you don’t want to be speaking to the receptionist, or find possibly the operations guy if it’s a sales software like a CRM product or something like that. You need to get the right department, then you need to get to the right people in the department. It’s not necessarily the top person in that department, especially if it’s larger. You need to be contacting the people who may use it, who can then influence. If you have an expensive CRM product, or a some sales software product that costs, you want multiple people to use it and it costs a few thousand a month. If that company is not of that size, or doesn’t have a large sales source, they are never going to be interested. They are not going to buy your software and then go and build a sales team around it. They are not going to commit to your product. They are going to do what they do. So if they don’t have it, they are the wrong people. They are not your target market. That means you need to know who is. Now we quite often refer to this as an avatar or customer persona. But very simply you need to know who it is. Now it’s very likely that you have some different types of customer persona. So take that software product. You may have that large company, you may have some different way of buying at a certain size and may have certain people you need to influence. Whereas in a smaller company, it may actually be the boss, or the head of department. In a large company, there may be a VP of department, but there’s other people under whose job that is. So you need to know those two types of customer will have a slightly different approach. Remember one where it’s the boss buying, he’s probably in charge of the budget. Has a bit more sway. Whereas if it’s in a department, there are possibly other people to be convinced, other considerations, budgetary considerations and things like that to consider. So remember, this is not so much about the job or anything like that. If they are not ever going to be your type of customer, you are wasting your time, aiming for the wrong customer. It’s just a waste of money, a waste of effort. This is the beauty with an automated sales and lead generation system. Like I can show you how to make. It’s quite easy. A perpetual sales cycle I call it. But it depends on you speaking to someone who could possibly be interested. Now in that example we mentioned, they don’t have the money, they’re not interested. There are people who are in your target market who don’t have the money yet. They may not be interested yet. But there’s always a possibility they will be. You just have to educate them or be their when they do need it. Be there when they do have the money. There could be a business that’s growing, and they may be thinking, when we grow, when we are much bigger, I’ll be wanting that. For example, for instance, we marketing for Owners is built with Rainmaker. Rainmaker I think costs $1500 a year or something like that. If you take something like hub spot. Hub spot is more like 15 or 20 thousand dollars a year. Now you may be in a business that you don’t want hub spot now, but you still may be interested in finding out about hub spot because you may be aiming to have it in the future. Maybe a couple years down the line. But you’re still interested. You are still a target customer. I hope that makes sense. Makes sense to me. But it’s really important because if you’re just spray and pray, you just put an ad in the paper and an ad in the trade press, and it just says, ‘we have the best, we have this special offer…’ nah. It’s not going to work. You want to know how to speak to them. How they will use it. If you know how to use it, you can speak in their language. If you know their words, the kind of terms they use, you can speak in their language, you can get inside their head, you can understand their problem. You can actually survey people. You can buy lists, you can survey people and find out what their problems are. And then point out that your solution can solve their problem. And perhaps they’d like to talk to you a bit more, etc. But know if they are not going to be the right customer, they’re never ever ever going to be interested in that. It’s just a waste of time and time is money. Simple as that. It is Tuesday. It is time for a Tool Box tip. And this one is going back, it’s a golden oldie. It’s funny. I say it’s an oldie because I’ve used it forever. It seems like it’s been around for a long time but all this stuff is still very new. And these things have not been around for more than a couple of years. But today’s tip is for Trello. Trello is, Trello is a project management software. It is very very simple to use. Once you get started, it’s one of those intuitive ones. It is used by so many people, you can actually google or go on YouTube and search for examples of Trello boards. They call them a board. Where you put up and work through a project. And you can see the ways other people use it. Now the beauty of Trello is Trello is free. Now they do have paid versions and so on. But Trello is widely used. Tomorrow is our expert interview series and I finally tracked down Andre Chaperon. He’s kind of British. He claims to be British, he lives in Gibraltar nowadays. But the guy is genius. Email marketing, all of the top experts, all of the top experts will tell you that Andre Chaperon is fantastic. One of the absolute best. Get on that interview. Do not miss it. I guarantee you will love it. See you soon.